Summer Vacation for UG Courses for the academic year 2018-19. Summer Vacation for PG & B.Tech for the academic year 2018-19. Revised Almanac of B.Tech II year (CBCS) IV Sem (CSE,ECE, EEE) for the academic year 2018-19. Revised Almanac of I & II year B.A/BBA/ B.Sc./B.Com(Gen). B.Com(Comp). B.Com(Voc). B.Com(Hons.) II & IV Semester for the academic year 2018-19. Revised Almanac of III year B.A/BBA/ B.Sc./B.Com(Gen). B.Com(Comp). B.Com(Voc). B.Com(Hons.) VI Semester for the academic year 2018-19. Almanac for B.Ed 2nd year course for the academic year 2017-19. Almanac for M.P.Ed 1st year course for the academic year 2018-19. Revised Almanac of M.A./ M.Sc./ M.Com/ MSW courses II year III & IV semester for the academic year 2018-19. Almanac of M.A/ M.Sc./ M.Com/ MSW 1 year courses I & II Semester for the academic year 2018-19. Almanac of IMBA/IPC II & III year courses III&IV / V & VI Semester for the academic year 2018-19. Almanac of IMBA/IPC I year course I&II Semester for the academic year 2018-19. Almanac of B.Tech I year course I & II Semester for the academic year 2018-19. Almanac of B.Ed I year I & II Semester for the academic year 2018-20. 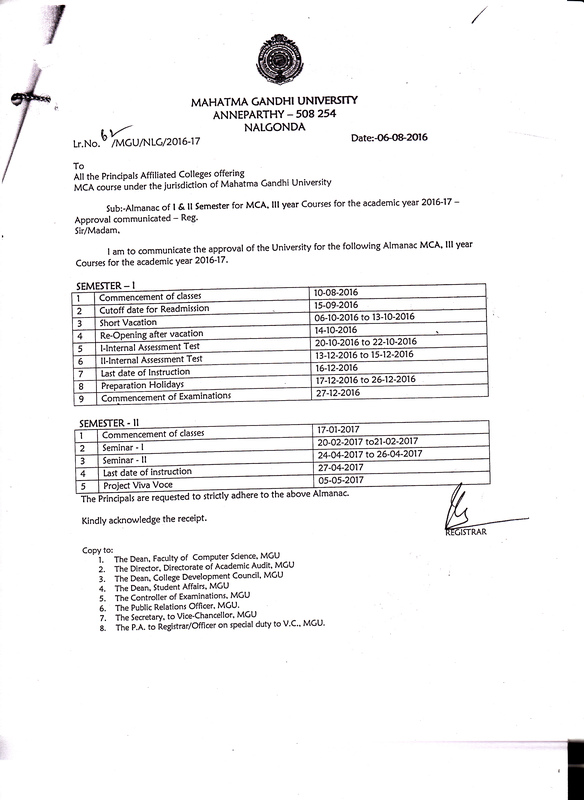 Almanac of MCA III year course V&IV Semester for the academic year 2018-19. Almanac of MBA/MCA/MBA(TTM) I year courses I & II Semester for the academic year 2018-19. 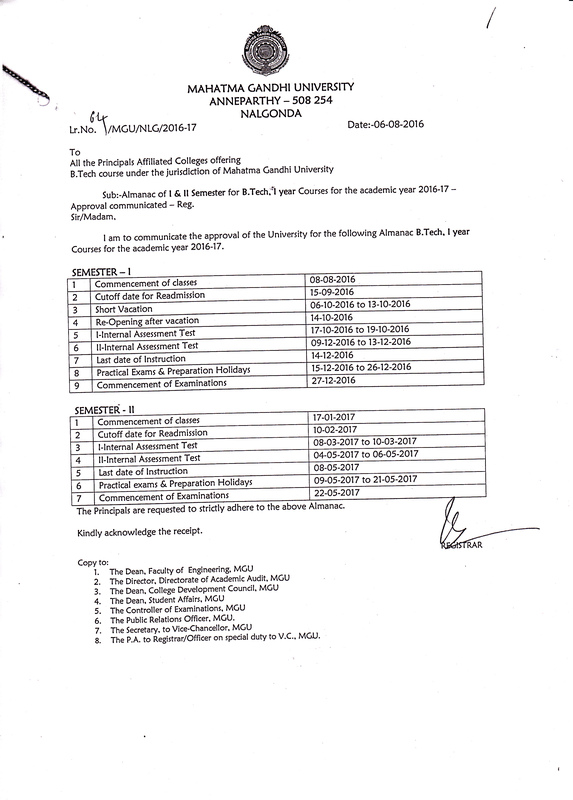 Almanac of MBA/MCA/MBA(TTM) II year courses III & IV Semester for academic year 2018-19. Almanac for B.P.Ed & D.P.Ed 1 and 2 year courses for the academic year 2018-19. Almanac of B.Tech (CBCS) CSE, ECE, EEE Semester III,IV,V & VI for the academic year 2018-19. Schedule for the Pre-Ph.D Programme Course Work Classes, 2018-19. Almanac of IMBA and IPC Courses IV and V year for the academic year 2018-19. PG II year almanac for 2018-19. UG I, II and III year Almanac for 2018-19. B.Ed First Year (I & II Semester, 2017-19 Revised Almanac. Almanac for I & II Year B.A/B.Sc/ B.Com(Gen), B.Com(Comp), B.Com (Voc), B.Com (Hons) II & IV Semester for the academic year 2017-18 - Approval Communicated. Almanac of I & II Semester for B.P.Ed & D.P.Ed 1st year courses for the Academic year 2017-18 - Approval Communicated. Revised Almanac for 1st Year B.Tech I & II Semester for the Academic year 2017-18 Approval communicated. B.Ed Second Year (III & IV Semester) 2017 - 18 Almanac. Almanac of 3rd and 4th Semester for B.P.Ed and D.P.Ed 2nd year courses for the academic year 2017-18. Approval communicated. B.Ed First year (I & II Semester), 2017 - 2019 Almanac. Almanac of IMBA / IPC 2nd year III & IV semester for the academic year 2017-18. Almanac of MBA / MBA(TTM) / MCA 1st Year course I & II - Semester and MBA / MBA(TTM) / MCA 2nd year III & IV Semester for the academic year 2017-18. Almanac of M.A/M.Sc/M.Com/M.S.W 1st Year courses I & II Semester for the academic year 2017-18. Almanac for 1st year B.Tech I & II Semester for the academic year 2017-18. Almanac of Integrated MBA & Integrated Pharmaceutical Chemistry courses V, VII & IX and VI, VIII & X Semesters for the academic year 2017. Almanac of MCA lll year V & Vl Semester for the academic year 2017-18. Almanac of B.Tech lll & lV year -l & ll Semester (CSE,ECE,EEE) for the academic year 2017-18. Almanac of B.Tech II year - III & IV Semester (CSE,ECE,EEE) (CBCS) for the academic year 2017-18. 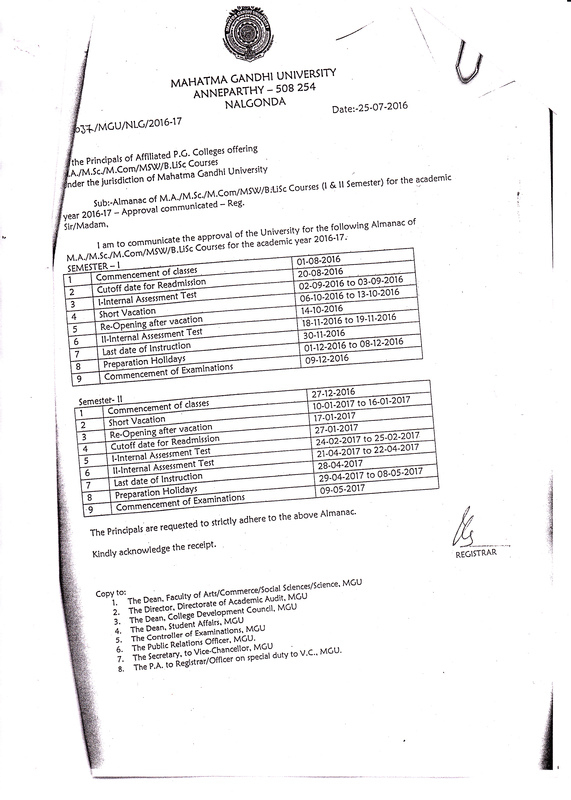 Academic and Admissions on transfer schedule of lll year B.A./B.Sc./B.Com(Gen), B.Com(Comp.) B.Com(Voc), B.Com(Hons.) for the academic year 2017-'18 - Approval communicated. 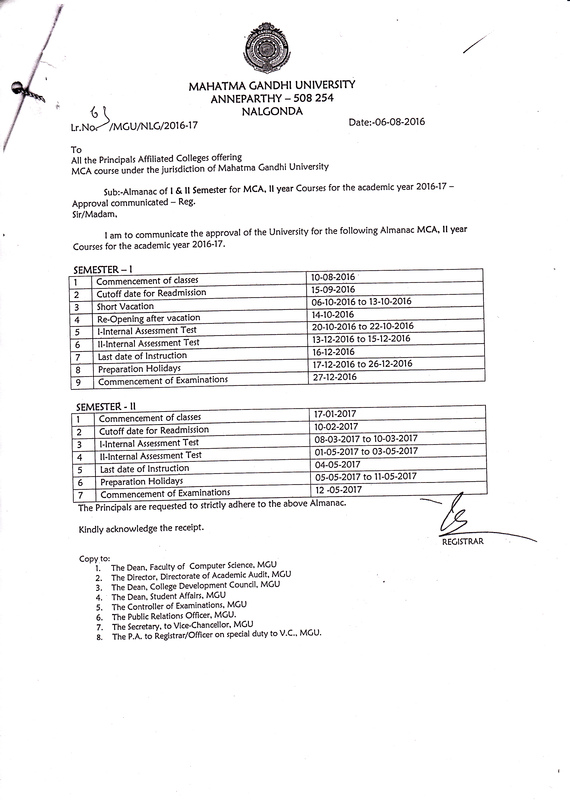 Almanac of lMBA & lPC courses V, Vll & lX and Vl, Vlll & X Semesters for the academic year 2017-18 Approval communicated. 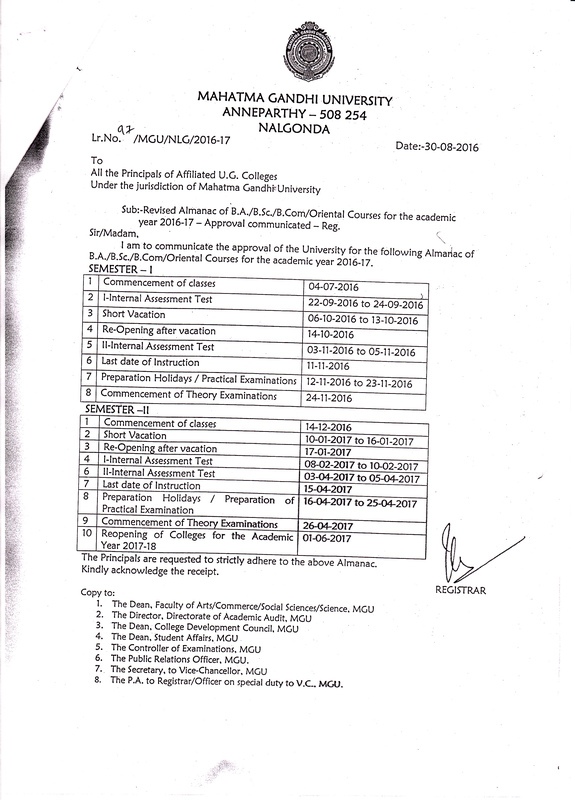 Academic & Admissions on transfer schedule of lll year B.A./B.Sc./B.Com (Gen), B.Com(Comp. ), B.Com(Voc. ), B.Com(Hons.) for the academic year 2017-18. B.Ed Almanac for the III & IV Semester 2016-17. B.Ed Almanac for the I & II Semester 2016-17. 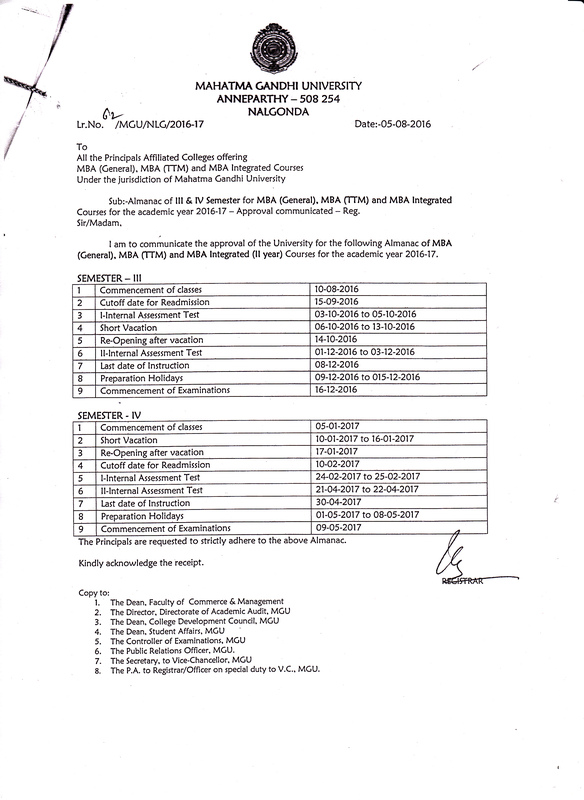 Revised Almanac of III & IV Semester for MBA (Gen), MBA (TTM) II year Courses for the academic year 2016-17. 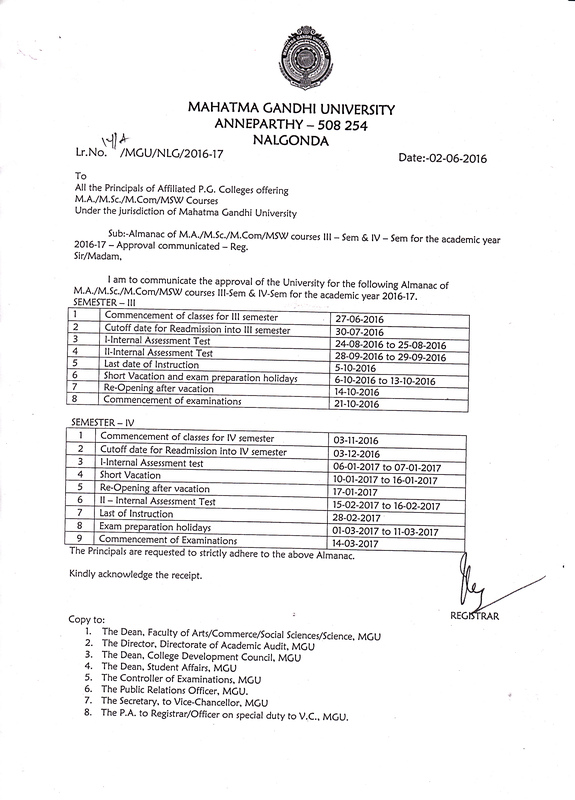 Revised Almanac of M.A./M.Sc./M.Com/MSW courses III - Sem & IV - Sem for the academic year 2016-17. 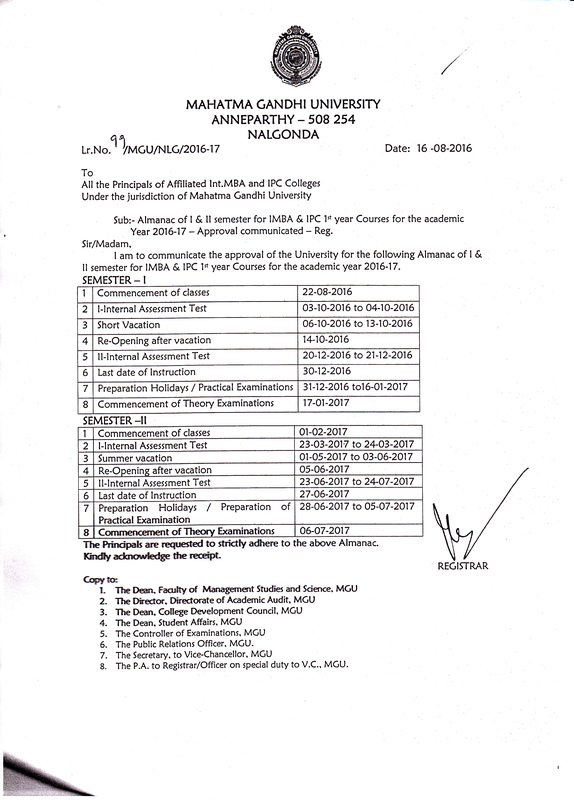 Revised Almanac of M.A./M.Sc./M.Com/MSW/B.LiSc Courses (I & II Semester) for the academic year 2016-17. Almanac of M.A./M.Sc./M.Com./M.S.W courses III - Sem & IV - Sem for the academic year 2016-17. Academic & Admissions on transfer schedule of II & III year B.A/B.Sc/B.Com(Gen), B.Com(Comp), B.Com(Voc). B.Com(Hons) for the academic year 2016-17.